The AmeriCorps New Jersey Watershed Ambassadors Program is an environmental community service program administered by the New Jersey Department of Environmental Protection. Twenty members are selected each year to raise public awareness about water and watershed issues and to promote stewardship through direct community involvement. Ambassadors are placed with host agencies in each of New Jersey's twenty Watershed Management Areas and work with local non-profit organizations, government agencies, schools, utilities authorities, and citizens to improve water quality through education and restoration projects such as stream cleanups, invasive species removal, rain barrel workshops etc. We are no longer actively recruiting for the 2018-2019 term of the NJ Watershed Ambassadors program. If you are interested in possibly serving for 2019-2020, please check back during late Spring or early Summer 2019 for recruitment information. For questions regarding the program or recruiting process, please call Amanda Lotto, Program Manager or Patricia Ingelido, Program Supervisor via email or at 609-633-1441. 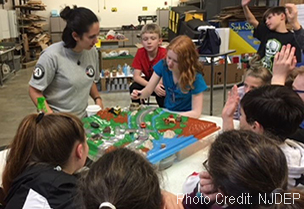 2017-2018 WMA 19 Ambassador Isabella Castigloni teaching students about non-point source pollution & how runoff impacts water quality. 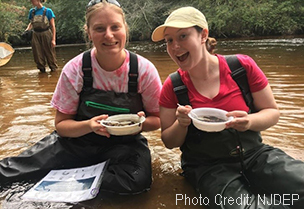 2017-2018 WMA 20 & 4 Ambassadors Julia Galayda and Julia Bresnan learn how to identify macroinvertebrates in a stream at Parvin State Park during their training week.